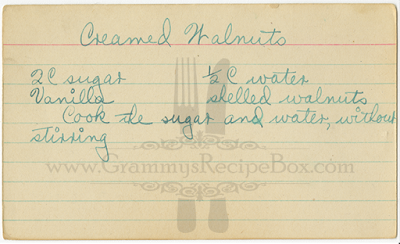 This recipe appears to be written in Grammy's handwriting (her handwriting looked different when she wrote in fountain pen). It is undated, but I suspect this recipe pre-dates 1941 (the year she got married). Without testing this recipe, I cannot give further details. I suspect the vanilla is added to the sugar mixture as it begins to form a thick syrup. I don't know if the walnuts are supposed to be dipped in this syrup as a candy coating or if they are supposed to crushed and "creamed" to create a walnut cream. Any insight from other family members that may have had this recipe would be greatly appreciated.